NEW YORK/WASHINGTON -- South Korean Foreign Minister Kang Kyung-wha said Friday she seeks to ensure North Korea delivers on its promise to dismantle its nuclear weapons program. Kang was in New York to meet with US Secretary of State Mike Pompeo and member states of the UN Security Council over the latest developments since North Korean leader Kim Jong-un made a commitment earlier this year during his summits with the South Korean and US presidents to the “complete denuclearization” of the Korean Peninsula. 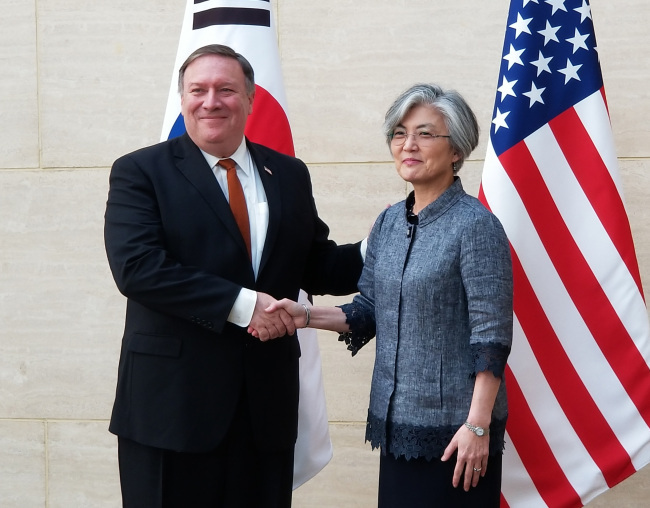 Kang and Pompeo held talks at the South Korean mission to the UN before providing a joint briefing to representatives from the 15 member states of the UN Security Council. The minister reminded reporters ahead of the meetings that North Korea has repeatedly made a “clear commitment” on complete denuclearization, including during last month’s summit between Kim and US President Donald Trump. “We will hold them up to that commitment,” she said. Kang and Pompeo last met in Tokyo early this month after the top US diplomat visited Pyongyang to seek more detailed commitments regarding the summit agreement reached by Trump and Kim. The joint statement included a US commitment to providing security guarantees to North Korea in exchange for its denuclearization, and North Korea’s promise to recover and return the remains of American soldiers killed in the 1950-53 Korean War. Speaking to Korean reporters after the meetings, Kang said there was agreement among the UN Security Council members on the need to keep sanctions on North Korea until it fully denuclearizes. Kang told the UN briefing that any easing of sanctions must be preceded by steps to denuclearization, but she also acknowledged that a “limited” exemption may be necessary to maintain the momentum for dialogue with Pyongyang. “Granting South Korea a waiver (from sanctions enforcement) is of a completely different nature from granting another country a waiver,” the diplomat said, alluding to the unique relationship between the Koreas. The foreign minister also spoke to the close “strategic communication” between Seoul and Washington. “There has never been a time when our communication and coordination have been this close,” she told reporters, referring to her talks with Pompeo. “Since Secretary Pompeo’s latest visit to North Korea, the process to repatriate the remains of American soldiers has begun, and North Korea and the US are expected to resume follow-up negotiations at the working level,” Kang said. Meanwhile, in Washington, Chung Eui-yong, chief of South Korea’s presidential National Security Office, met with US National Security Adviser John Bolton.